PRINCETON, NJ -- The percentage of Americans saying they have a "great deal" or "quite a lot" of confidence in U.S. banks is at 23% this year -- essentially unchanged from 22% last year, and far below the pre-recession level of 41% in June 2007. For the second year in a row, the percentage of Americans expressing very little or no confidence in U.S. banks exceeds the percentage expressing a great deal or quite a lot of confidence. This was not the case as recently as June 2007, before the recession began, and even June 2008, just prior to the financial crisis later that year. The degree of confidence in banks has fallen in all regions of the country compared with the pre-recession/financial crisis days of 2007. The difference between then and 2010 shows the degree to which confidence is recovering in various parts of the nation. The largest decline is in the West, probably reflecting the continued problems in the housing sector in many Western states. The smallest is in the East -- but this includes an improvement from the financial crisis days of 2009 -- even as confidence levels in the West continued to decline. As Europe struggles with its bank "stress tests," U.S. banks can take some solace in the success of their own tests of a little more than a year ago. In this regard, Federal Reserve Board Chairman Ben Bernanke told the Senate Committee on Banking, Housing, and Urban Affairs on Wednesday that, "Like financial conditions generally, the state of the U.S. banking system has also improved significantly since the worst of the crisis. Loss rates on most types of loans seem to be peaking, and, in the aggregate, bank capital ratios have risen to new highs." On the other hand, the Treasury, the Federal Reserve, and banking regulators still have a challenge ahead of them. Bernanke also noted that "many banks continue to have a large volume of troubled loans on their books, and bank lending standards remain tight." Further, Gallup's polling shows Americans' confidence in U.S. banks is stabilizing, although it has done so at historically low levels. Americans still have higher confidence levels in banks than in Congress, HMOs, big business, and organized labor; however, banks trail small business, the medical system, newspapers, and more. 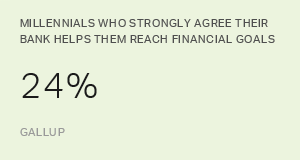 In sum, these results suggest that much needs to be done to restore Americans' trust in the U.S. banking system. For example, this poll was taken prior to the passage and signing of the Wall Street reform legislation. The politics surrounding that legislative effort as it worked its way through Congress probably did not help build confidence in U.S. banks. It remains to be seen whether the regulatory decisions that follow will do more to build confidence in the U.S. banking system than hurt it. The U.S. needs a healthy financial system to achieve a sustainable economic recovery going forward. While it will take time, restoring Americans' confidence in U.S. banks is an essential element in achieving that goal. Gallup's Economic Confidence Index is on its way in July to registering its largest one-month drop since October 2008 -- when the country was reeling from the emergent Wall Street financial crisis. The trigger may have been the stock market plunge in late June. When asked which of three current legislative initiatives Congress should make its highest priority, Democrats favor financial reform, while independents and Republicans choose immigration legislation. Overall, Americans split more evenly between the two, and give a new energy bill lower priority.